I snuck in a little craft time before I do some housework this morning. 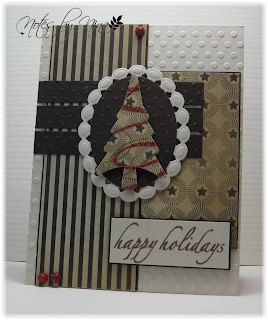 I am enjoying creating cards from some challenges this weekend. This card is for the current Tuesday Morning Sketches Challenge. For some reason when I see stars on a sketch I think masculine card, so that is what I created although I added in some gems just for fun. 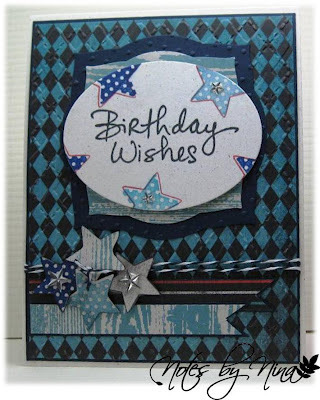 Supplies: Natural White and Navy cardstock, Designer Paper –Authentique, There She Goes Stamps-Bit of Stardust, Stamp It– Happy Birthday, Spellbinders die cuts, twine and gems. The Friday Mashup - Let's Get Twiney. It is another beautiful autumn day outside, I might even be enticed to rake a few leaves a little later. For this morning however I am posting a quick card before I run out the door for a Spin class. I could not resist joining in the fun for this week's Friday Mashup. 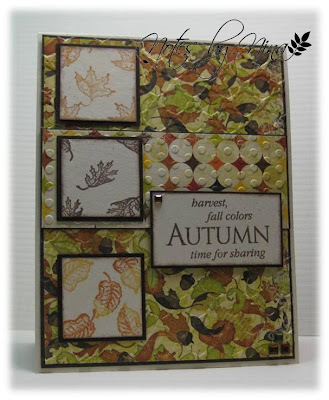 Make a "Fall Leaves" themed project. Or Make a project with "Twine". 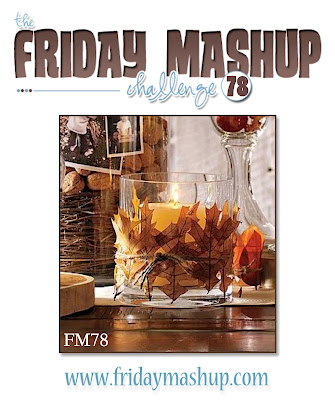 Or "Mash it Up" and create a "Fall Leaves Themed project using Twine". I though I would use a couple of items I have had in my stash for a long time but have never used (felt leaves and glitter dots). This paper is so pretty with a slight sparkle to the back ground and all the fantastic fonts, there is even some metallic words tossed in for fun. I added some felt leaves and created a ellement with circle punches and a glitter dot. 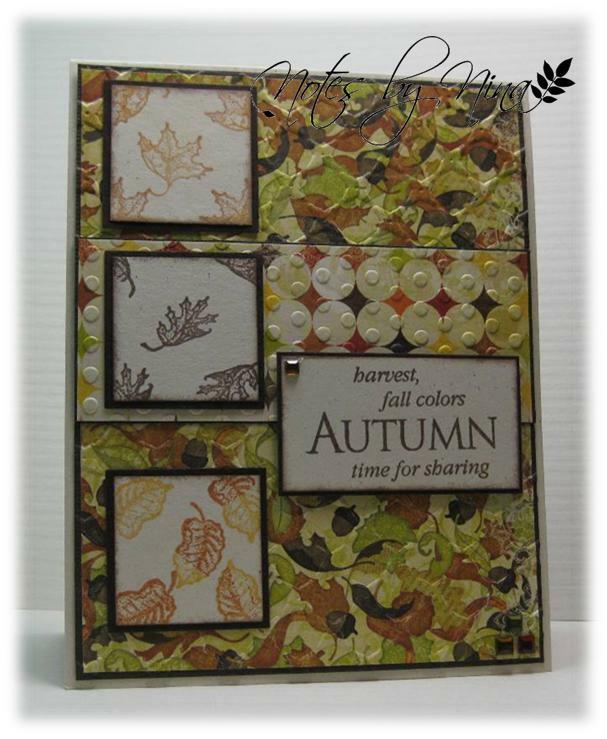 Supplies: Cream and brown cardstock, Designer Paper-TPC, Verve-Autumn Splendor, twine, Leaves- Creative Impressions, Recollections glitter dots. Happy Friday everyone, what a fabulous fall we are having here in Victoria so far. Sure it is staying darker long in the morning and getting darker earlier in the evening. and maybe the temperature is a little chillier in the morning as I head off to work too, but the leaves are starting to turn and are looking stunning and the you can’t beat the sunshine. My nephew has his birthday at the end of the month and I always send a little cash so I created a slider pocket that I could add a gift card or cash to. 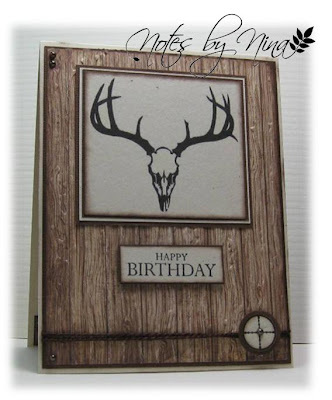 I used my Memory Works - Awesome 6x6 paper pad that I purchased online at Scrapbooker's Paradise and I added some texture with an embossing folder. The pull tab ribbon is attached with a brad that was created to look like a button. I finished with some ribbon and a ribbon slide. I attached a little cash with a glue dot and it is hidden inside the pocket. Supplies: Natural Ivory and brown cardstock, Designer Paper-Memory Works, embossing folder, Making Memories ribbon slide, ribbon and misc brad. 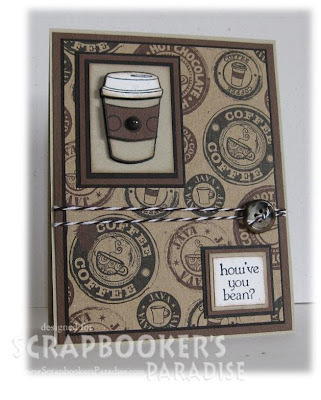 Be sure to stop by the Scrapbooker's Paradise Pondering blog to take a look at all the wonderful samples that the Challenge team have created. There is still time to play this week's Playing in Paradise challenge. There are prizes every week. I used one of my many 6x6 paper pads for this card, I want to create a card with soft colours. I paper pieced the tea cup with matching DP. I added some foam tape to give dimension and finished with some twine and pearls. Supplies: Cream and brown cardstock. Designer Paper-Glitz, TPC Studio-Coffee Cafe, Fiskars -Latte Love, misc punches and twine, Recollections pearls, Spellbinders die cuts. It is starting to feel alot like fall here in Victoria, we are still having beautiful sunny days but they are getting cooler and it makes me want to craft my little heart out. I had a table at a local Stamp Exchange yesterday so I have been getting stuff ready to sell rather then crafting and I have missed it. 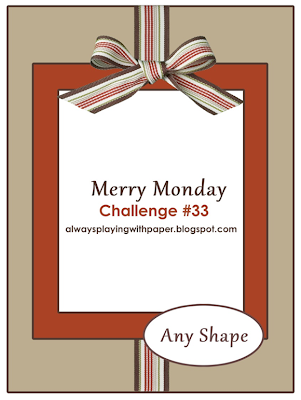 We have a new Merry Monday challenge today, the sketch is nice and simple this week. I found all sorts of fantastic things when I went through my supplies for the sale, so many stamps I have not even inked up yet. I coloured this image with a mix of my watercolour pencils and tombow markers. I embossed the background and finished by adding some gold twine and pearls. 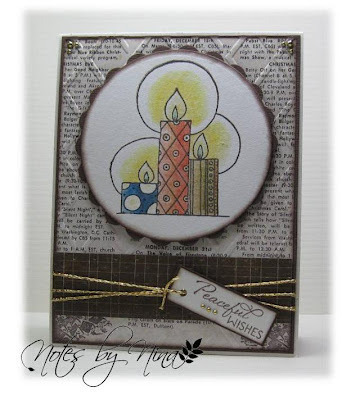 Supplies: Natural White and brown cardstock, Designer Paper - Echo Park, Sunshine Designs -Candles, Verve-Glad Tidings, Spellbinders die cuts, embossing folders, miosc twine and pearls. 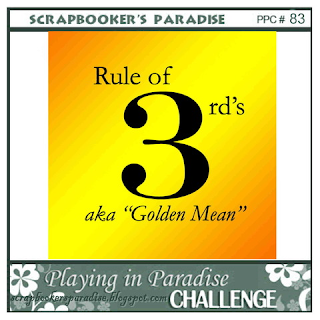 Happy Friday one and all, it is time for a new challenge for Playing in Paradise , and I am hosting today's challenge. I imagine that most people start their morning with a cup or two of coffee or tea. I am a tea drinker but I have friends and family that are not even civil till the first sip of coffee and maybe even little chocolate (my sister... ). 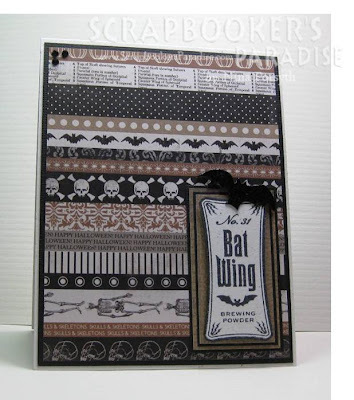 I found this fabulous designer paper from Canvas Corp on one of my many shopping visits I take to the Scrapbookers Paradise online store and I could not wait to use it. In my usual fashion I used lots of layers, even the coffee cup is paper pieced to give it a 3D look. See all the details on the Playing in Paradise blog I finished with an old button I found in my stash, some bakers twine and a brown candy dot. 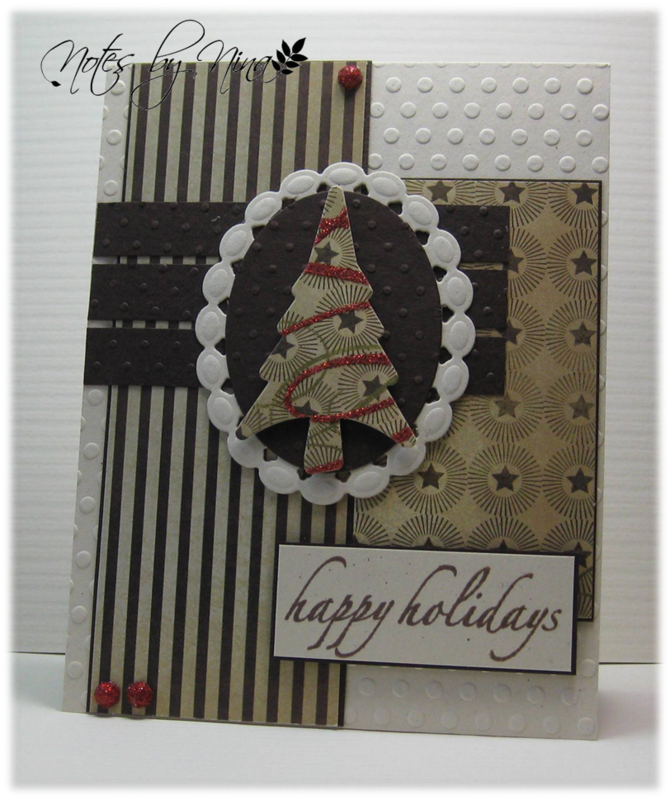 Supplies: Kraft and brown cardstock, Designer Paper-, TPC and Fiskars Stamps, Candy Dots, twine and button. 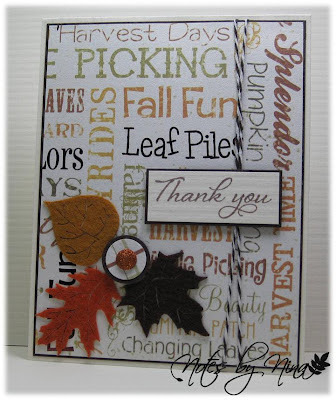 If you arrived here from the Scrapbooker's Paradise blog - wonderful, if not please stop by to take a look at all the fabulous samples that the Design team have created. Be sure to leave a comment if you visit. **Reminder** join it the challenge, there are great prizes each and every week. I spent a good amount of time doing a fall clean around the house this weekend, closets, drawers and such. It felt great but I did not get as much time to craft as I would have liked, I am not complaining though the rain will be here soon enough and I can spend lots of time creating. 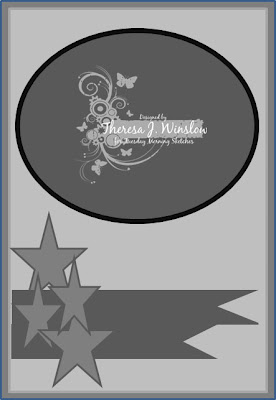 When I purchased this stamp I could not wait to see how it would look embossed, I am still not sure.. What do you think? I used DP from my scrap bin and unfortunately I don't recall who made it. I layered the embossed image added some ribbon and finished with a sentiment. 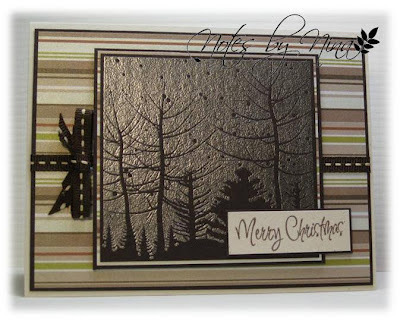 Supplies: Natural Ivory and brown cardstock, Designer Paper-Unknown, Hero Arts-Snowy Winters Night, Recollections-Merry Merry, misc ribbon. Stop by Always Playing with Paper to see what the Merry Makers have created. 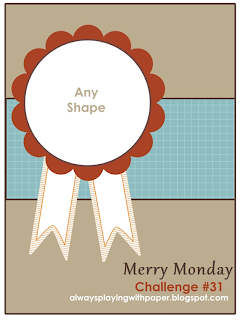 We would love for you to play along with us for Merry Monday this week. Hi Blogger friends, we have a brand new Playing in Paradise challenge for you today. Merle is inspiring us with colours this week. I tried to match the colours the best I could with designer paper. I layered each section, I used a Sizzix die cut for the flowers. I finished with some pearls. Supplies: Natural Ivory and blue cardstock, Designer Paper-Echo Park, Close to my Heart - For Every Occasion, Sizzix die cut, embossing folder, pearls. 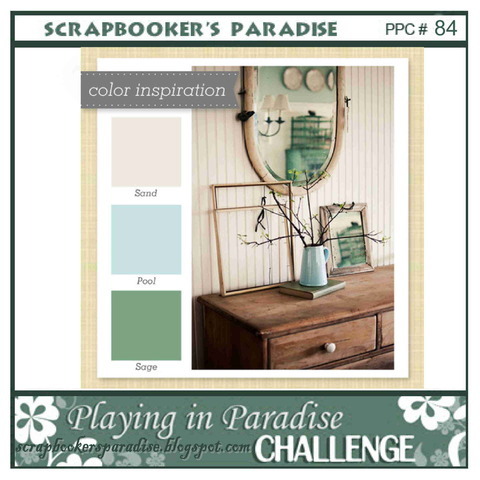 The Playing in Paradise challenge team have created some fantastic projects, stop by the Scrapbookers Paradise blog and take alook, comments are always welcome. **Reminder** join it the challenge there are great prizes each and every week. Freshly Made Sketches is having a one year Anniversary and I wanted to join in the fun. 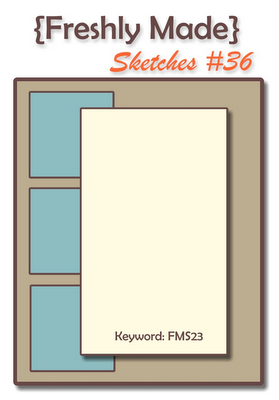 I chose sketch number #36 for my card. 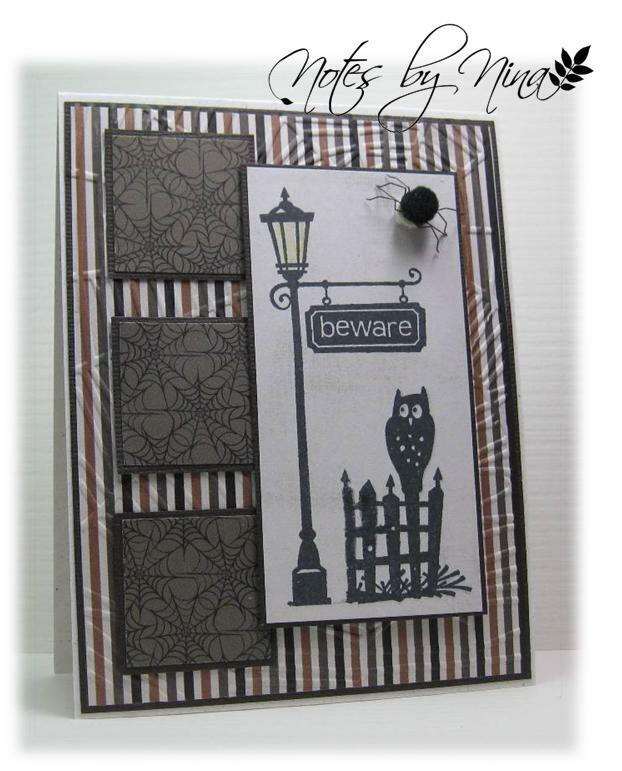 I love making Halloween cards they are always fun, I don't have a clue what I will do with them though :). 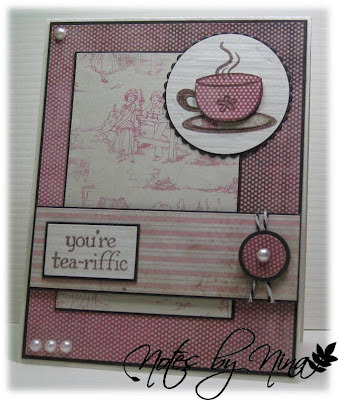 I brought this fantastic Carta Bella 6x6 paper pad and I paired it with some Close to my Heart stamps. I added some texture to the background and punched out the squares and layered them. The focal image is popped up with foam tape and I finished with a spider embellishment. 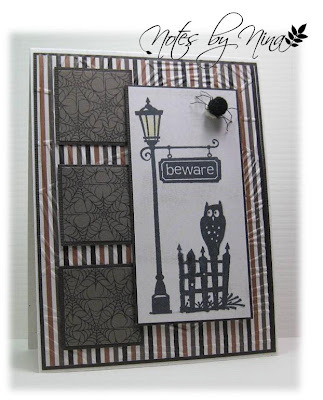 Supplies: Natural white and brown cardstock, Designer Paper-Carta Bella, Close to my Heart-Moonlight, Jolee spider, misc punches, embossing folder. Happy Monday everyone, a short post for the new Merry Monday challenge. Lesley has a wonderful sketch for us on her Always Playing with Paper blog. I am still using my scraps, I did not realize how many I have in my stash. I added texture to the background and some of the layers. 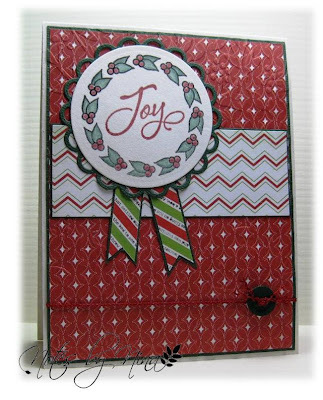 I used Spellbinders and Verve die cuts for the elements and I finished with some glitter candy dots. Supplies: Cream and brown cardstock, Designer Paper-My Minds Eye, Close to my Heart-Christmas Scripts, Verve-Winter Fun, Spellbinders die cuts, embossing folders, candy dots. It's friday and we have a new Playing in Paradise challenge, Angela is our hostess this week. I am still not quite sure if I have the hang of this challenge, but it does not take much to confuse me. Make sure to visit the Playing in Paradise blog to get the full details on the challenge. 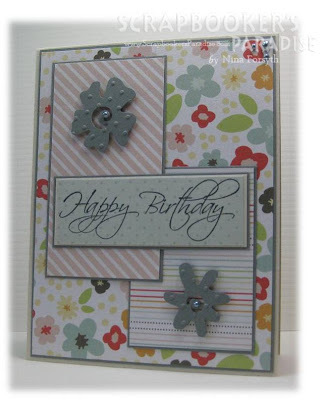 I had just opened a box from Scrapbooker's Paradise when I started making this card, and I could not resist breaking the seal on a new Carta Bella 6x6 paper pad. 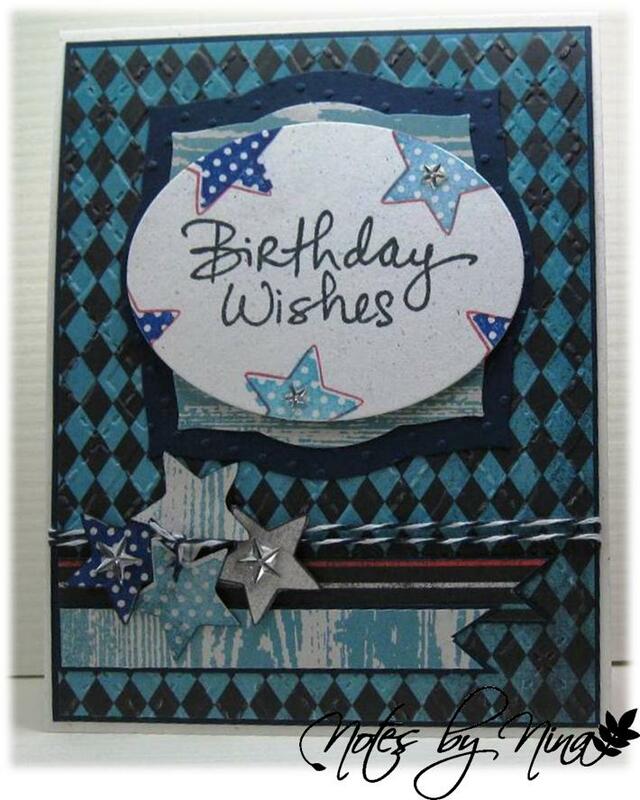 I stamped the sentiment, cut it out and popped it up with foam tape then added a couple of layers of cardstock. I stamped and cut out the bat, I heat embossed it with detailed black embossing powder and popped it up with foam tape. Supplies: Natural white and black cardstock, Designer Paper - Carta Bella, Close to my Heart - Magic Potions Holiday, misc bats, gems. 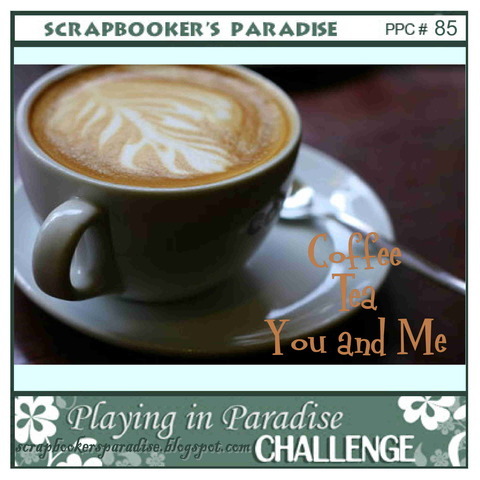 The Playing in Paradise challenge team have created some wonderful projects, stop by and take a peak, comments are always welcome. **Reminder** join ithe challenge.... there are great prizes each and every week. This card started out for a challenge later this week, except I totally messed up on the concept so it gets posted today. I would say fall is my favorite time of the year, I love the wonderful colours nature displays, the crispness in the air, even the faint smell from a wood fireplace. My small town roots are showing :). This Bo Bunny paper is new for fall I think... I love 6x6 paper packs and I can't resist when I see one. I layered and added some texture to the background. 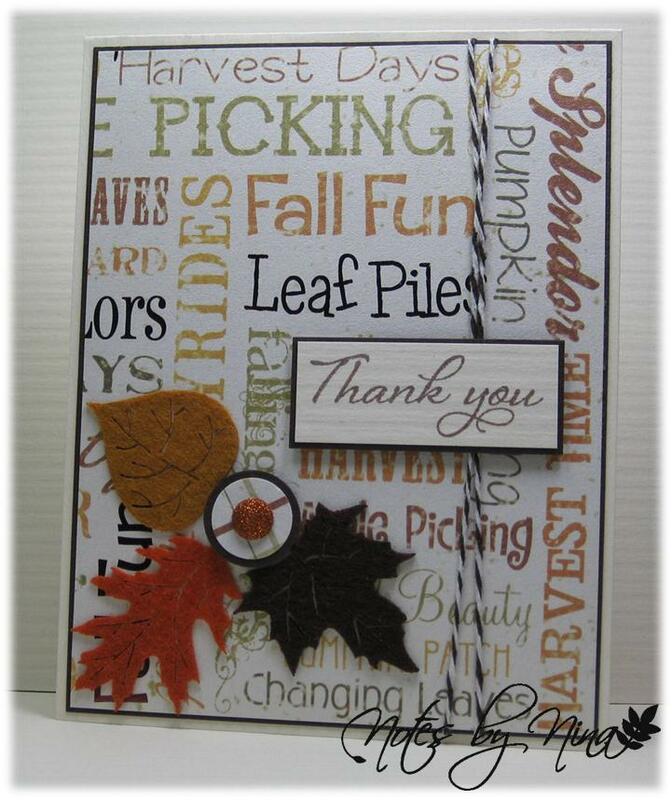 I punched out the squares and stamped leaves multiple times. I finished with some square gems. 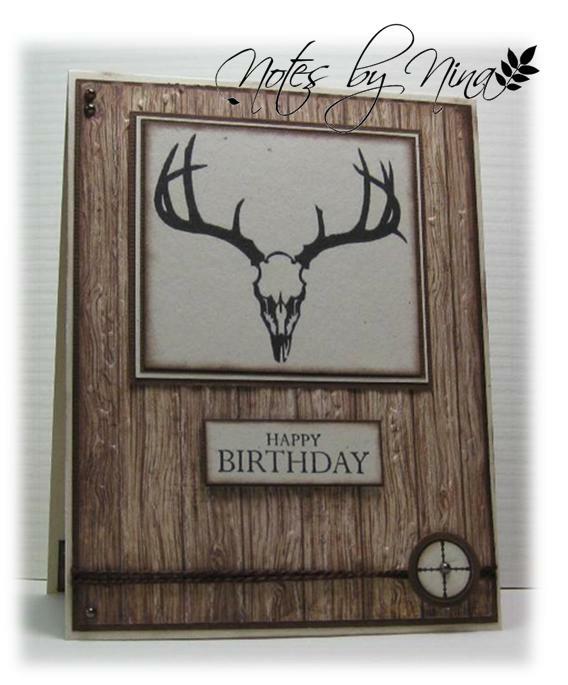 Supplies: Natural Ivory and brown cardstock, Designer Paper - Bo Bunny, Inkadinkado and Hero Arts stamps, Recollections gems, embossing folders, misc punches. My husband is great for asking for last minute card requests, this one is for one of his buddies. The boys like their man toys and go hunting in the fall so the card was easy enough to put together. I found this new paper this weekend from the Farm House Paper Company that was perfect for this card. Both the deer skull and gun site are clipart that I printed off and edged with brown ink. I embossed the background, and finished with twine and pearls. Supplies: Natural Ivory and brown cardstock, Designer Paper - Farm House, Gina K Designs - Labels with Love, Clipart - Clker.com, twine and pearls. We have had a beautiful Labour Day weekend here in Victoria, I have even managed a little time in my garden. We have a new Merry Monday challenge for you today and again Lesley has out done herself with another wonderful sketch. Even if paper is coordinating, I am not always sure I have made a card too busy or not. I added some texture to the background, and finished with some twine and a button. I coloured the wreath with my watercolour pencils. Supplies: Natural Ivory and green cardstock, Designer Paper-Bo Bunny, Verve Stampes - Glad Tidings, Spellbinders die cuts, twine and a button. Stop by Always Playing with Paper the Design Team members have created. 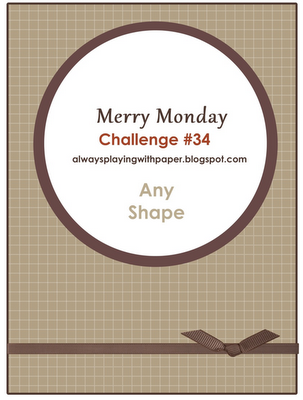 We would love for you to play along with us for Merry Monday this week.